You can use your Notepad as a Diary to store any event or information with the current date and time. It automatically appends the current time and date to the file whenever you open it. Then you can add the event and hence a diary can be made out of a text file. Now when you will open the file again, you will see the current date and time being inserted automatically after the .LOG line you wrote. 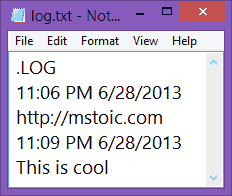 This will happen automatically every time you reopen the notepad file. So in this way you can take notes and use notepad as a diary.